This flavorful Moroccan inspired chicken salad recipe takes minutes to make & is full of ingredients like avocado, pineapple, roasted red peppers & spices. In a bowl mix, harissa, smoked paprika, ground cinnamon, dry cilantro, lime juice, lemon juice, salt & pepper. Mix until just combined. Add raw chicken breasts to bowl. Toss so that chicken breast is covered. Place in refrigerator for 10 minutes to let sauce soak to the chicken. In the meantime, to a food processor add, garlic clove, red wine vinegar, lime juice, red pepper flakes, smoked paprika, greek yogurt, and olive oil. Blend until smooth. Set aside. Heat grill to medium high heat, add marinaded chicken to grill along with fresh pineapple rings. Grill chicken for 5-7 minute per side. (until there is no more pink in center) Grill pineapple for 2-3 minutes per side, so you get grill marks. Assemble salad, add 3 oz. 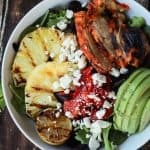 spring mix to 4 small bowls, top each with roasted red peppers, grilled pineapple, avocado slices, crumbled feta cheese, and sliced grilled harissa lime chicken. Serve with vinaigrette on the side.